George VI acceded to the throne in December 1936, following the abdication of his brother Edward VIII. In that troubled and unexpected situation it was with some urgency that the new coins of the realm were designed and struck. This beautiful 10-coin collection includes - Farthing, Halfpenny, Penny, Nick-Brass Threepence, Silver Threepence, Sixpence, English Shilling, Scottish Shilling, Florin and a Half-Crown. 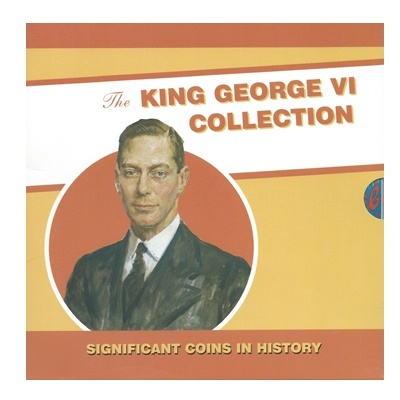 On their reverse some of the coins of George VI's reign have desgins that were originally produced for Edward VIII. They include two of the best-remembered coin designs of the twentieth century: Paget's much admired design based on the Golden Hind for the halfpenny and Harold Wilson Parker's charming wren for the farthing. The coins are housed in a colourful informative presentation folder, produced by the Royal Mint.